I’m so excited about this little treat, and the absolute ease of it, that I just have to write about it. Had a girlfriend come over last night (both our hubbies are away) and she bought the main dish, I made salad and dessert. I was feeling very uninspired all day and towards the afternoon I was racking my brain about what to make for dessert. Then I found this recipe which has only 3 ingredients! Too easy! In a saucepan over a moderate heat, bring to the boil cream, sugar and rind of one lemon, stirring. Continue boiling for about 3 minutes. At this stage the cream still hadn’t thickened up very much and I was thinking it would be a disaster. But read on… Take off the heat and add the juice of one lemon, stirring. This is where the cream immediately curdled a little, hence thickening. Pour the mixture through a strainer into a jug to remove the lemon rind and create a super smooth consistency, like hot custard. Pour into individual serving dishes (I used red wine glasses, but if you have martini glasses, these would look amazing). As a variation, I popped frozen raspberries into the bottom of the glass before I poured in the mixture. It takes 2-3 hours to set in the fridge. 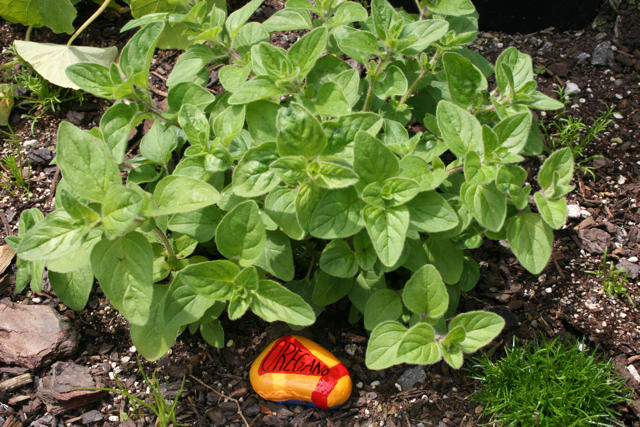 Once set, add mint leaves for garnish. 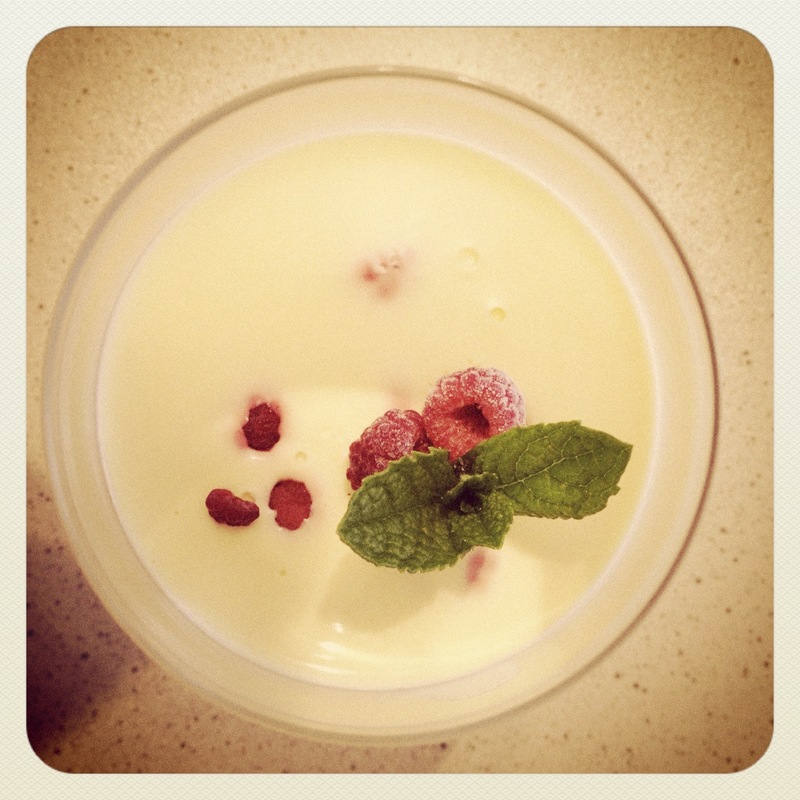 It tasted so decadently lemony and smooth, that I will definitely be making this again, although not too soon as I’m sure this isn’t great for the old waistline. Try it! Go on, I dare you! 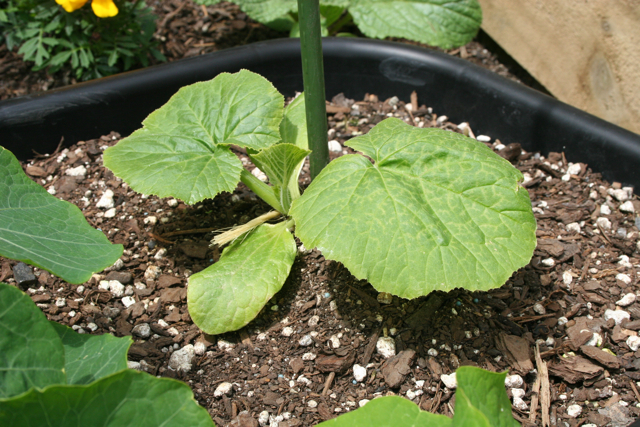 Before I start this post, I just need to reiterate that I’m very new at this gardening thing, so before you read and then chastise me in your comments, please just chuckle inwardly, then set me straight with words of encouragement, and expert advice. 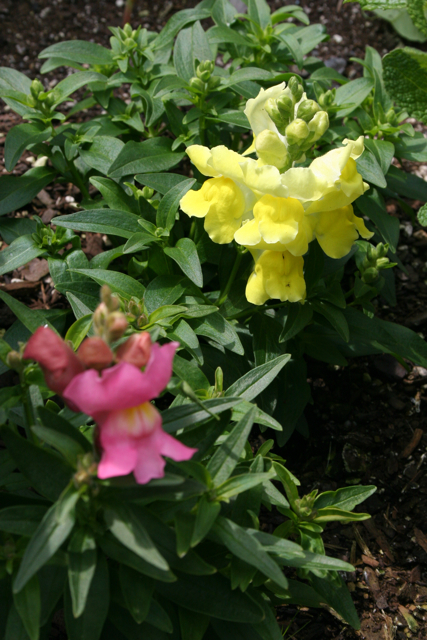 Well, it’s not just a herb garden… there are flowers and some vegetables too. A mish-mash. Kind of like my head-space. 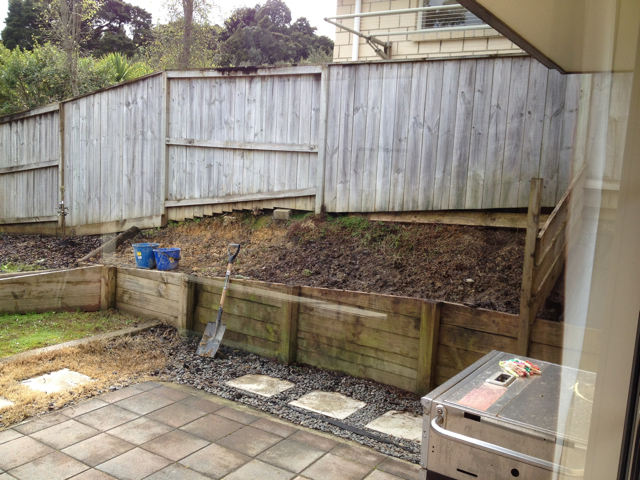 When we moved to our new house in Totara Park, the garden was a mess. The landlord admitted he and his wife were no gardeners, so it looked pretty awful. Fortunately, they’d already pulled out a couple of monsters, but on one entire side of the house they had planted rambling Rosemary bushes which were colossal. A few weeks after our shift we (and when I say we, I mean my husband) pulled the wretched things out, just about hospitalizing himself in the process. But we got it done and it looked better bare and barren than it did with woody, scraggly Rosemary. Next problem: clay soil. Urgh! I was still fairly ignorant though so covered up the barren-ness with weed-mat and planted some lovely ground-cover gardenias along one side of the house. Weeks later they had not changed in shape, size or colour. Maybe they are just the slow-growing variety (if that exists). That’s when I started doing some research. The more searching and reading I did, the more I got excited about the idea of gardening. 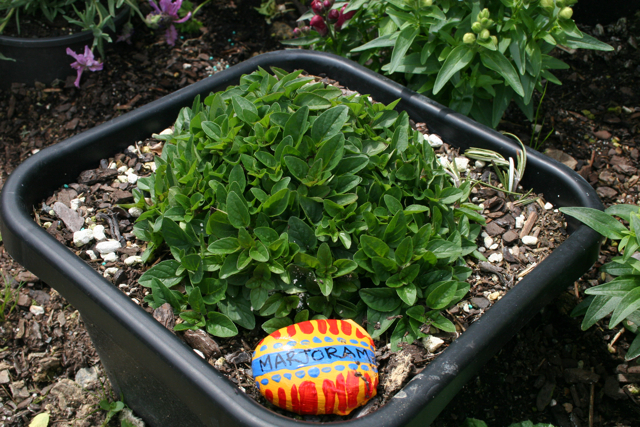 That’s where the herb garden comes in. 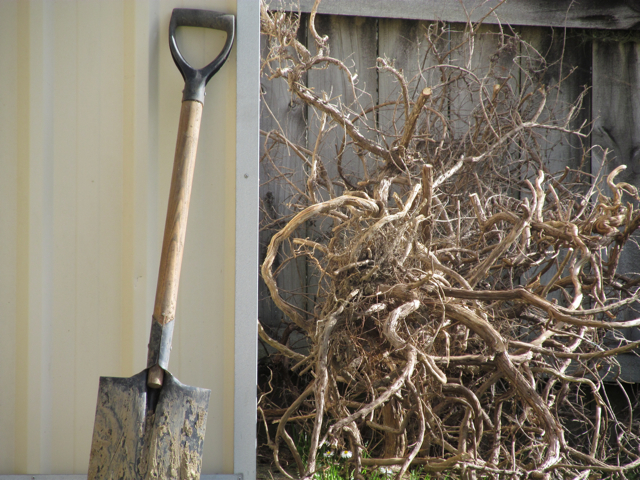 This is the gnarly dreadful stuff that my hubby pulled out of the garden. Digging out the clay soil – a pig of a job. One section of raised bed was particularly clayish so I (and when I say I, I mean me) began to dig. And dig, and dig and dig. After reaching Germany (okay, slight exaggeration) I threw in all sorts of good composted soil, and pots and home-made trellis. And this is what I ended up with. Ta-dah! 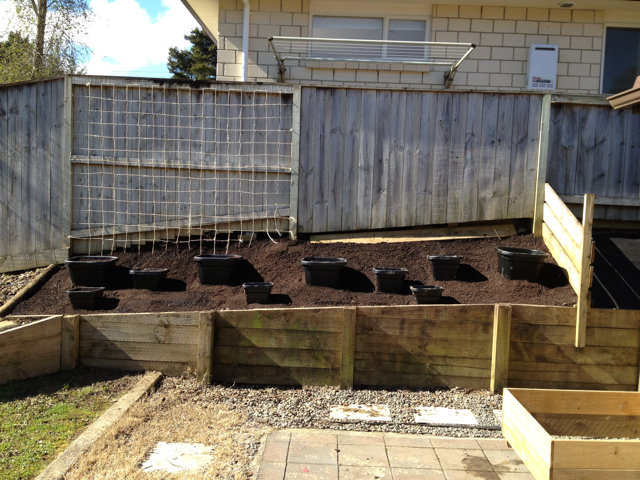 Ready for planting with pea trellis, pots and good soil. 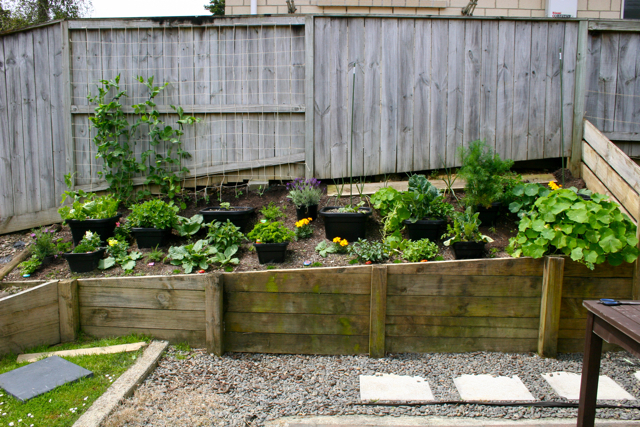 The plan I had in the back of my head was to have an area where I could plant edible herbs, medicinal herbs, some pretty flowers to attract bees, some pretty flowers to deter baddies, and some veges. After a couple of months of propogating (and some buying), it’s looking pretty good, and will by summer, hopefully be pretty amazing. There’s a myriad of living things in this raised, sloping garden. 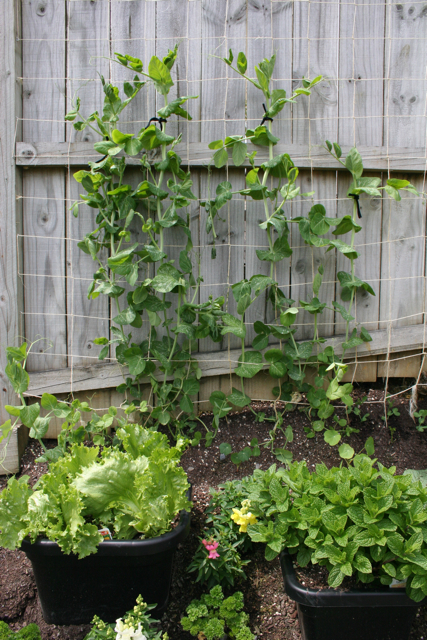 Alderman Climbing Peas are growing well up the trellis. Other veggies in there include broccoli, cucumber, zucchini, curly lettuce and garlic. 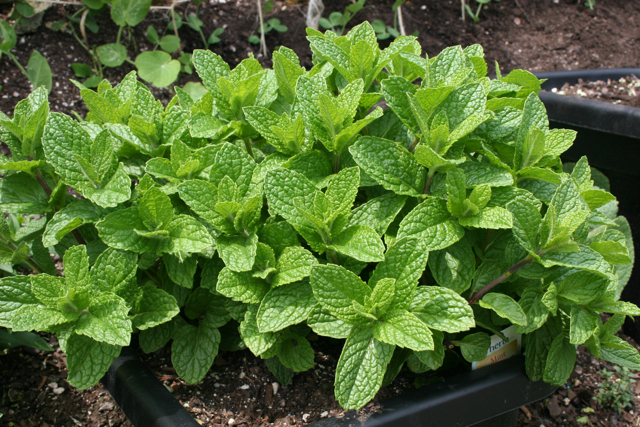 Herbs include staples like parsley, mint, sage, dill, oregano plus interesting things like marjoram, peppermint, lemongrass, pineapple sage. 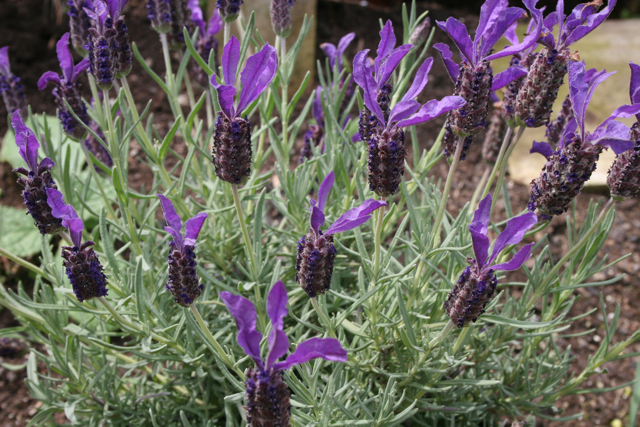 Then medicinal plants like feverfew, hyssop, borage, lavender, yarrow, and chamomile! Almost forgot to mention marigolds, nasturtium and these other flowering things that I don’t know the name of. I daren’t put more in otherwise there will be no room for my pretties to grow. I love looking at this little patch of transformed dirt. I’ve started on the other side of the section and that’s a work in progress which I’ll blog about when it starts looking like something other than a hunk of dirt – but it’s also going to be amazing! Basically the idea is to cut down on the grocery bill and boost our family’s fruit and veggie intake. Nothing like a salad made with fresh lettuce, fresh tomatoes and fresh cucumber picked only minutes before! What could be better for you? Bring on summer!! 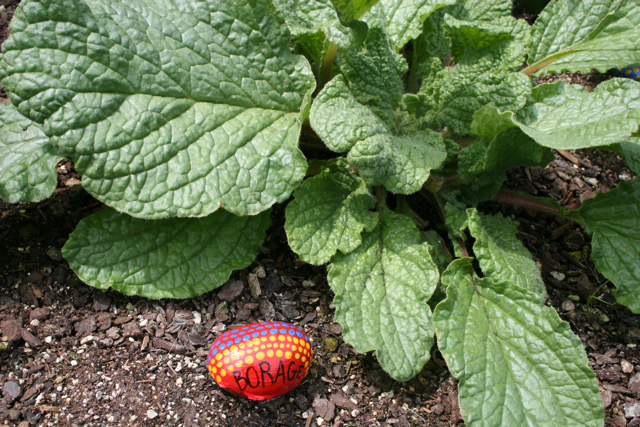 Borage… edible flowers and superpower medicinal properties (also a good bee plant). 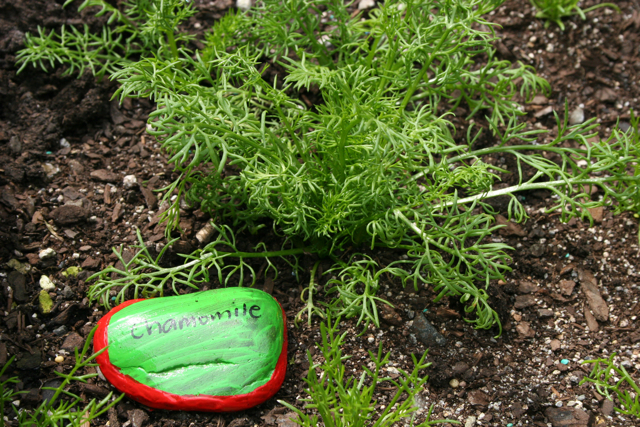 A variety of Roman and German Chamomile to make Chamomile tea. I can’t wait for flowers to appear. 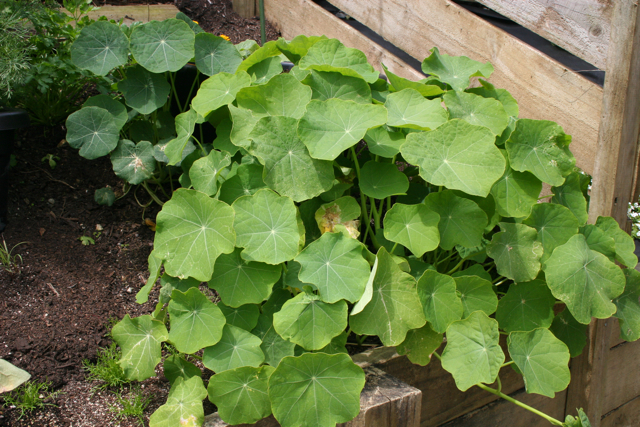 Nasturtiums (with edible flowers) are going crazy on one side and flailing on the other. Weird. Perhaps they like being a little more sheltered next to the wall? Spacemaster Cucumber. I’m hoping there’s enough room here to contain it’s spread. Apparently this variety takes up less room (whatever that means). 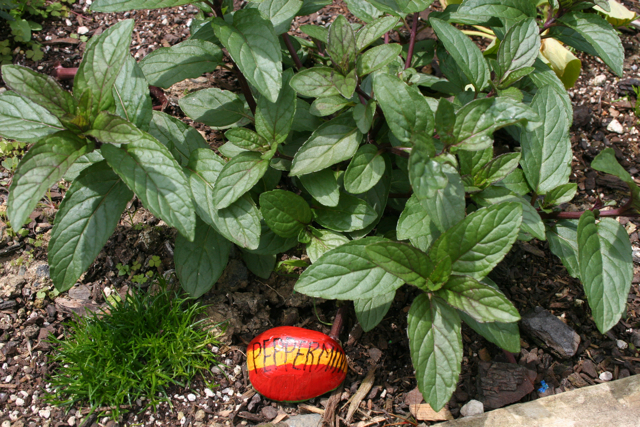 Did you know peppermint repels spiders? I can’t remember the name of these, but they’re beautiful. Alderman Climbing Peas. 3/4 of the way there. A little higher then hopefully (fingers crossed) we’ll harvest big fat juicy peas! The demise of the tomato was a learning curve indeed. I was ignorant. Now, better informed, I’ve got two well-established tomato plants in big pots which have just started venturing outside to harden off (or harden up as I tell my kids). Yellow flowers even! And little tomato plant seedlings getting stronger and bigger every day. We are in for a free feast!